Go Further and Achieve More, with Greater Ease. How does Dr. Jan work? 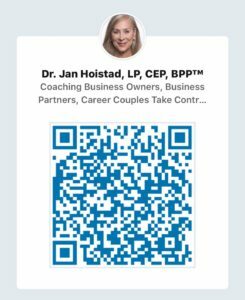 Dr. Jan coaches and partners with you through every transition – or Choice Point – in your professional and personal life. She’s fully committed to accelerating your ability to achieve your goals and develop a greatly satisfying life so you can move further, faster and achieve more with greater ease. Clients from all over the glob seek Jan’s assistance across numerous Choice Points in their lives so they remain aligned, successful and fulfilled. They appreciate her direct nature, caring persistence, and commitment to their growth and goals. 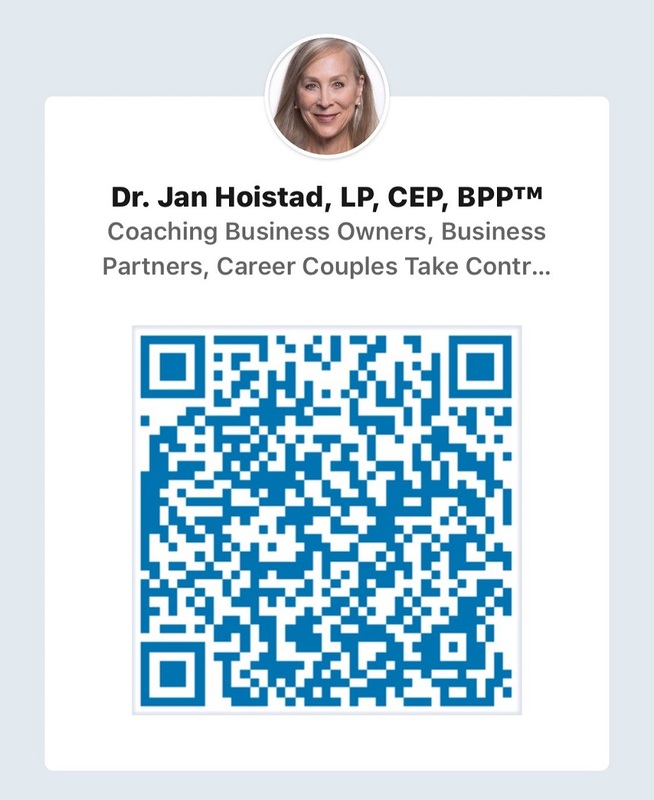 As the founder and CEO of DJHP, Dr. Jan Hoistad has helped professionals, business partners, and teams worldwide achieve ambitious business goals, joyful relationships, and a greater quality of life. 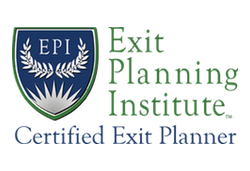 She partners with you through every Choice Point in your life and business. Whether you’re aimed at a big project, an expanded or transitioned business, or a more fulfilling life, Dr. Jan works with you to implement the best strategic solutions to achieve your goals. An expert in entrepreneurship, business acumen, human development, systems and stages, creativity and learning styles, Jan is a native of Minneapolis where she did her undergraduate work at the University of Minnesota in Psychology and Studio Arts. A Licensed Psychologist, she holds an MA and PhD in Developmental/Clinical Psychology from the California School of Professional Psychology’s campus in San Francisco where she lived for a number of years. This was followed by a stint of post-doctoral work on the opposite coast, in the mountains of North Carolina. Upon returning to Minneapolis she established her business guiding people to integrate their professional and personal goals as they develop across their lives. A continuous learner, Jan has completed extensive postdoctoral training in communications, negotiations, mediation, organizational advancement, and leadership development, along with training in negotiation from Harvard’s Project on Negotiation (PON) and mediation from Minnesota Dispute Resolution Services (MDR). She has taught in the psychology departments of San Francisco State and Sacramento State Universities and served on the faculty of St. Olaf College before starting her business. Jan has also conducted numerous workshops for professionals and couples around topics of partnering to achieve goals together. A prolific writer, Jan has published many articles, workbooks and books on communication, relationships, goal achievement, and career advancement. Chief among these are; Big Picture Partnering: 16 Weeks to a Rock Solid Relationship and supporting modules, Living Your Dreams Together: Conversation Cards for Couples, Tell Me What You’re Thinking, and Improve Your Career: Master Your Part in the Art of Relationships in the World of Work. Time with family, friends and four adored godchildren, supporting her favorite causes and organizations, exploring foods and the arts, travel and staying in shape—mind, body, and soul—occupy Jan’s spare time. She’s always got a long series of character-driven detective novels at hand, bemoaning the end of a captivating series. Along with great descriptions of far-off lands and both male and female detectives with great culinary skills, she finds the smarty-pants investigations akin to her daily discovery of ways to help her clients fulfill their goals. Insightful, dedicated, experienced entrepreneur: Dr. Jan Hoistad is an extraordinarily gifted leader who knows how to build businesses and the people who run them. Working with Dr. Jan Hoistad is both productive and a pleasure. We have utilized Jan’s talents for strategic planning in building our team of employees and developing strategies for growth. Dr. Jan provides the focus needed to look at the big picture and to create balance within both work and personal environments. Business owners and Team leaders can definitely benefit from Jan’s experience, insight, creativity, and ability to keep busy professionals on track with their goals. Jan has been an invaluable resource to grow, define, and sharpen our business. She is supportive, intuitive, clear, and creative. She has helped us vastly improve our hiring, employee management, and risk management processes, often with simple, creative strategies that make a big positive impact. Dr. Jan helped us step back and look at the Big Picture, further defining our company mission, values, and visioning for the future, and then grounding that vision in the present. Her blending of the practical improvement of systems with the creative visioning for the future has been an inspiring part of our work with her. With Jan’s help, we’ve been able to move our business forward without sacrificing our quality of life and partnering goals.